The Chesterfield Royal Hospital Charity is the Royal's official charity. 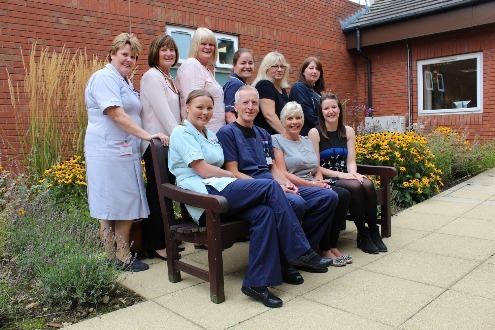 Thousands of pounds are donated every year through fundraising events and legacies and this page will detail some of the incredible efforts made by staff, visitors and former patients to raise money for these funds. You will also find information about what our charitable funds have been spent on and some upcoming events to look forward to. If you have any fundraising stories you would like to include then please email Emily Woodward, the Trust's Community Charitable Fundraiser by clicking here and to find out more about the funds and how to donate, visit the Trust's Charity page by clicking here . Booking a place on our charity page! For many people, working and visiting the hospital on a Wednesday, it's a ritual to take five minutes out to go down to the Information Point and look for a good read. 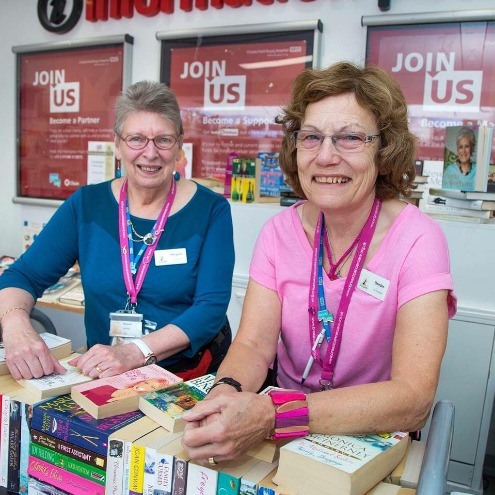 Affectionately referred to as 'The Book Stall', the ladies (including Margaret and Dierdre, pictured right) can be found surrounded by hundreds of books, encyclopaedia and the odd DVD that have been donated to help raise money for the Royal's cancer services. 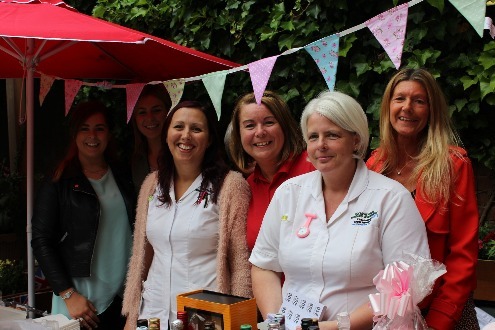 The ladies have been running the stall for around 14 years and, although an exact sum is unknown, they have raised an amazing £18,000 since April 2011. If you have any unwanted condition that are clean and in good condition, then you can drop them off on any Wednesday, in fact many people buy a book (most are priced at around £1.50) to donate it back, buy a new one and the cycle continues. Thank you once again for your support ladies! 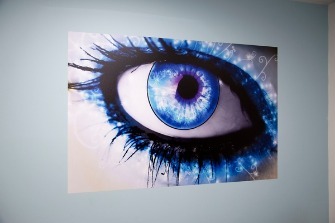 ​The Mayor of Chesterfield paid a visit to the Chesterfield Eye Centre after making it one of his three charitable causes during his time in office. 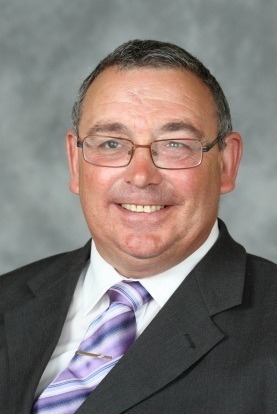 Councillor Barry Bingham has been Mayor of Chesterfield since 20th May and has a special interest in our Eye Centre and Sight Support Derbyshire, that has an office within the Eye Centre, due to being blind in one eye and partially sighted in the other. 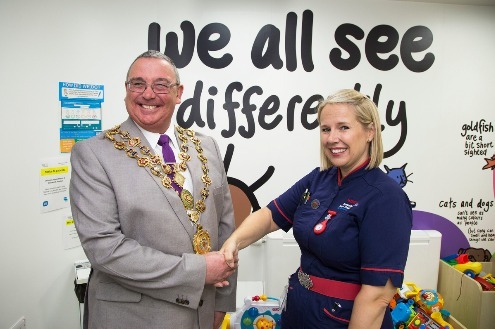 He and his wife, Mayoress Mrs June Bingham, were given a tour of the centre by Eye Centre Matron Claire Bond where he saw the paediatric area, diabetic retinopathy, the photography suite, eye testing area and the Sight Support Derbyshire offices. 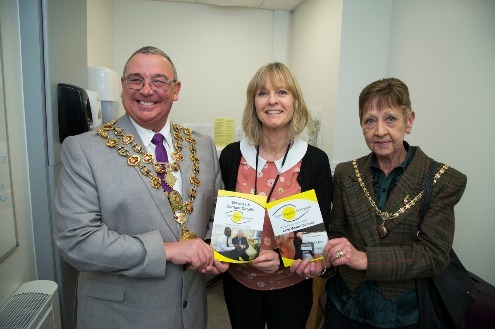 ​The Mayor reiterated his support before visiting the ‘Celebrating Our Success’ event where the Ophthalmic team also had a stand. 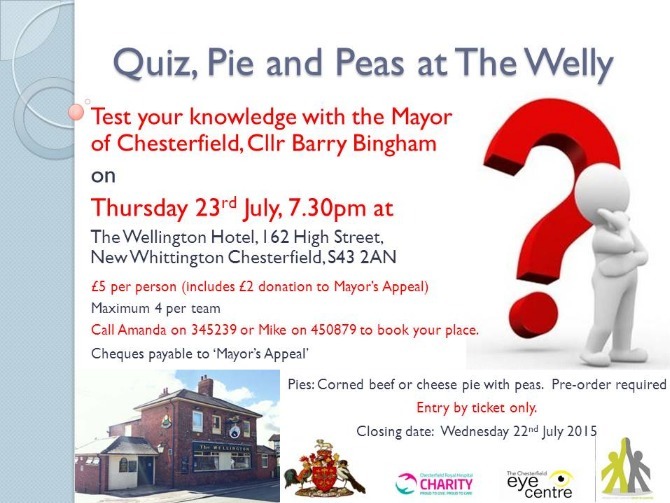 If you would like to find out more about the Mayor, Mayoress and their charitable appeal then click here. ​It’s always a pleasure to see a former patient in good health but in Shirley Goodall’s case her latest visit came with a nice surprise. Shirley was diagnosed with breast cancer in October 1995 and had a mastectomy the following month, beginning her chemotherapy in December. The treatment finished a year later in September 1996 and it was around this time that she decided to give something back. She said: “We wanted to organise a fun day which happened at the end of August 1996 in Rowsley School but the element that was really successful and seemed to capture people’s imagination was the Jumble Sale. We raised more than £1,000 during that first one so decided to carry on with it along with the afternoon tea and tombola which didn’t take quite as much organising as some of the other parts. ​Since then Shirley and her friends have helped to raise more than £11,000 that they know about and will be holding this year’s jumble sale on Saturday 7th November. Shirley is pictured above (front row, second from right) with members of the breast care team and her friends on the back row Carol Hempstead (far right), Susan Sellers (second from right), Janet Goodwin (third from left) and Diana Burgess (second from left). ​The staff from the local Tesco Extra store in Clay Cross came together to collect a staggering 265 toys for the Nightingale Ward at Chesterfield Royal Hospital. All Tesco stores were given a task to collect toys for their local children’s hospital/ward and the Clay Cross store certainly embraced the task 100%. Dawn Wilson from Tesco, Clay Cross: “I jumped at the chance when our store manager asked for someone to champion the collection. My daughter was admitted to Nightingale Ward for a few months so I know first-hand what a fantastic job they do and the way in which all of the team care for the children, taking every opportunity to make a child feel better or smile. When my daughter had been on the ward a group had come in dressed as characters from Frozen© and handed out gifts to all of the children. The smile that gave my daughter was priceless and I knew we really needed to get behind this collection and do our part. If you would like to find out more about how you can get involved with supporting Chesterfield Royal Hospital Charity please contact Emily Woodward on 01246 516332 or by emailing CRHFT.Fundraising@nhs.net. 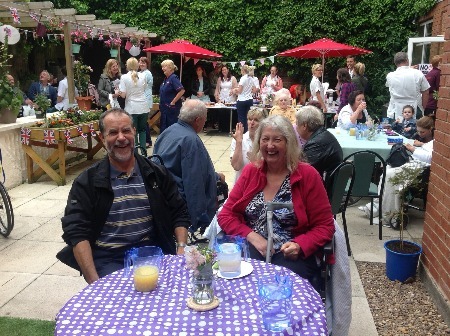 The stroke team raised more than £300 during what was an incredibly successful, second annual garden party. 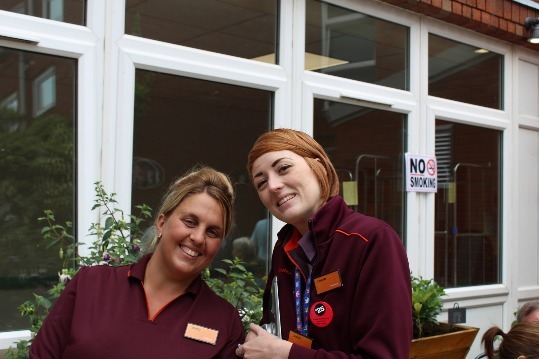 The team organised the event, supported by Sainsbury's Chesterfield, including a tombola, raffle and a cake stall featuring some impressive home made baking from the multi-disciplinary team which was attended by staff, patients and former visitors with their carers and families. 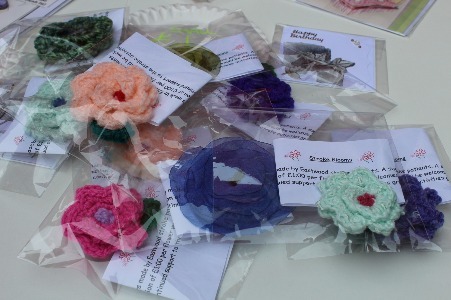 They also sold 'Stroke Blooms' (see below) which were crocheted by patients on the ward and sold for £1, all money from which goes towards the stroke unit via Chesterfield Royal Hospital Charity. wonderful response from everybody there and hope it'll be an initiative that'll really take off. "There were also cards that were made by the patients and everybody had a fantastic time. Luckily the weather held off as well and I think the patients who were there got a lot out of the day so a big thank you to everybody involved in organising and supporting our party." Above: The Sainsbury's crew, thank you for supporting the event! Left: The party in full swing!!! ​Sunday 13th September - Trip to the National Arboretum with pick-up from Staveley at 8.45am. Cost is £15 to include transport and buffet. Please contact us directly if you are interested in more information about this trip. Thursday 29th October - Bargain Hunt and Bric-a-Brac stall at the Market Festival with The Mayor and his wife, Mrs June Bingham, leading the teams. Donations of bric-a-brac for the stall are greatly welcomed, please contact us directly and we will arrange collection. so-fareast-language:EN-US;mso-bidi-language:AR-SA'>Thursday 29th October - Bargain Hunt and Bric-a-Brac stall at the Market Festival with The Mayor and his wife, Mrs June Bingham, leading the teams. Donations of bric-a-brac for the stall are greatly welcomed, please contact us directly and we will arrange collection. 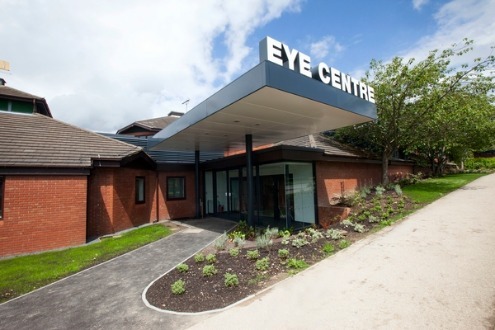 The Eye Centre, a £2million development, opened in June 2012 and brought all Ophthalmic services together under one roof. Before the build, services were spread across outpatient suites 3 and 10 as well as off site at the old Saltergate building. A big thank you to Councillor Ann Holmes, Chair of North East Derbyshire District Council, who has chosen to support the Chesterfield Royal Hospital Charity with monies pledged to the cancer services that will be part of the multi-million pound Chesterfield Royal Macmillan Cancer Centre development. 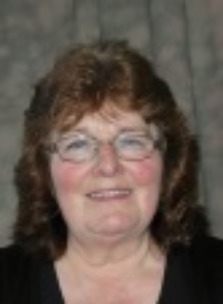 You can find out more about why Councillor Holmes has decided to support our Charity by visiting her page, just click here for more. ​You can pick up a copy of Ann’s book at the flower shop in the Royal’s main entrance for £9.95, half of which goes to the charitable funds. For further queries you can call Ann on 01246 229610 or email ajaybee47@gmail.com. ​Ann Bateman has turned her passion for photography into a fundraising venture by producing a book pf poetry featuring her eye for a good picture. 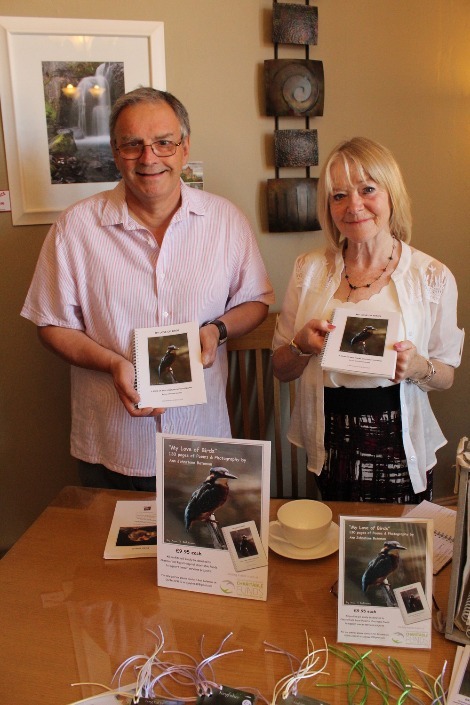 ‘My Love of Birds’ contains 130 pages of poems and photography by Ann, the proceeds of which go towards the Royal’s charitable funds in support of the Trust’s cancer services projects. Ann said: “A friend of mine wrote eighteen poems and they were beautiful, it inspired me to take some photographs to accompany them. I wanted to turn it into a book but I initially shelved the idea until last year when I took the decision to write some of my own and complete it and commit it to print. 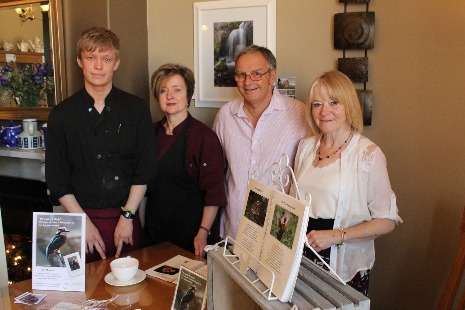 Ann has done a number of book signings, the latest of which took place at Stephensons Tea and Coffee House who were kind enough to accommodate her for a beautiful summer’s morning in June. The new Green Gym goes live! The Royal has taken delivery and installed its new 'Green Gym', paid for through our charitable funds. 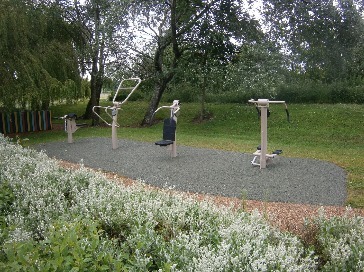 The gym can be found next to the relaxation garden at the back of the hospital by the new wards and features four pieces of equipment to help give you a comprehensive workout. It was installed after a number of suggestions from recent Your Voice and staff surveys about a gym but, with space within the walls of the hospital at a premium and the growing popularity of outdoor gyms in local parks, the green gym was chosen. Members of staff were given the chance to comment on what pieces of equipment they at 'Celebrating Our Success' in October 2014 and the picture opposite is the end result. The gym cost just under £12,000 to buy and install. ​The newly appointed president of Chesterfield Scarsdale Inner Wheel, Sue Young, has selected to support Chesterfield Royal Hospital Charity as her chosen Charity of the Year with monies pledged to cancer services. Sue has a very busy year ahead with lots of events and activities planned which we will keep you updated on throughout the year.